CNN’s Zain Asher: What happened to her Igbo and Nigerian name? Nigerians and Africans were happy and excited to see one of their own receiving such acclamation and glowing recognition from Hollywood and Academy Award. It was easy for everybody to recognize that his name CHIWETELU EJIOFOR is not Asian or European but African. Chiwetelu Ejiofor is proudly an Igbo name that comes from Igbo people of Nigeria. Nigerians and Africans do not have to scratch their heads to figure out his heritage with his outstanding Igbo name. ‘Chiwe’ Ejiofor was born in England to Nigerian immigrant parents Arinze and Obianuju Ejiofor . His parents were of Igbo heritage of Nigeria and they maintained their Igbo culture, name and heritage which they successfully passed down to their son, Chiwetelu Ejiofor. But who is Zain Asher? 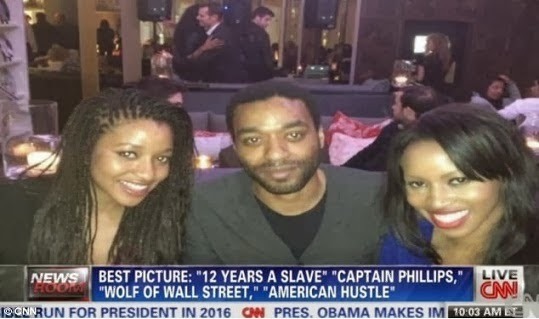 She is Chiwetelu Ejiofor’s younger sister who works as a financial reporter for the network news CNN. Zain Asher is an Igbo woman despite her non-Igbo name. Both siblings have same parents with same Igbo heritage. One chooses to keep his Igbo name; another chooses to drop her Igbo name. This is becoming common to many Nigerians and Africans especially those born in Western world and actors in Nollywood. Most of the time , the parents are poor cultural and heritage ambassadors because some of them believed that native, tribal and country of origin’s name may be a barrier to a successful career in Europe or America. But they failed to understand that the psychology of name can be a source of pride and joy that makes one to be dedicated in upholding the integrity of one’s heritage. Take away the pride of native name and one becomes generic, assimilated and uninteresting. It must be highlighted or noted in some cases some people chose a name that is alien or different from their heritage simply because they happen to like it and nothing is wrong with that provided there is no ulterior motive. Then, what’s to a name? Is it the way it looks? Appears lazy … fast before the eye? Or is it the way it sounds? handsome, antiquated, oddity or strange? … pronouncing or spelling ? … the name or the person ? What is a name ? Gbenga Adefaye, President of Nigerian Guild of Editors NGE) made below presentation at CNN Multichoice African Journalist Awards ceremony, held at Lusaka, Zambia. Nine months ago, insurgents struck with terror at journalism practice in my country- Nigeria. Zakariya Isa, a journalist with the government owned Nigerian Television Authority was shot dead in front of his home in Maiduguri. Zakariya left widows, children and other dependants. Three months later, Eneche Akogwu, the 31 year old, set-to- wed vibrant reporter with a private television station, CHANNELSTV, Lagos was also shot dead while covering the activities of the insurgents in another city – Kano. Eneche left aged parents and a distraught fiancée. I doubt if those gentlemen had life insurance cover. It is a running story: in April, three newspapers, Thisday, SUN and The Moment were bombed simultaneously in Abuja and Kaduna. Boko Haram have claimed responsibility for the killings and the bombings. They have threatened more assault on free press and free speech. The insurgents want to determine the content of our media. They threatened : you either report our activities wholesale or you do no report on us at all. And if you must keep our stories out of your press, then you are barred from reporting security and government activities concerning us. Otherwise, you are also an enemy. The insurgents do not discriminate in their attacks on the press. Practically, everyone who does not perform to their description of what is accurate news report is in danger. Periodically, threats are issued via the Internet against the press. But I tell you, that is a mistake. The Nigerian Press is too sophisticated to be so intimidated. Our story has always been that when the press is threatened, it comes out stronger. Our press which survived the most brutal of military dictatorships and wears the battle scar as a badge of Honour, now complemented by a fast growing social media will surely survive this current assault on free press and write the story thereafter. courageous two who have fallen, in active service. Thank you for the recognition.